Certain recipes do not really warrant an introduction given how well known (and well loved!) they are. Claudia Roden’s Orange and Almond Cake is one of those recipes. A fat-free sponge made with whole oranges (cooked until soft) and ground almonds instead of flour, the final cake is more than the sum of its parts. Simple in appearance, the cake is deliciously moist and incredibly perfumed thanks to the use of two whole oranges per cake. In fact, it is so good that once you start making it, it becomes difficult to stop. My parents went through a long phase of cooking oranges in batches (the process takes about 1 hour) and freezing the orange pulp so the cake was that little bit quicker to prepare once another craving for Claudia Roden’s delicious cake struck. I read Helena Atlee’s The Land Where Lemons Grow with great interest during the summer. And while I most certainly do not have a green thumb it was nonetheless fascinating to read about the origins of the different citrus fruits we now eat on an almost daily basis, how revered ornamental citrus trees once were and the impact the appearance (and disappearance) of certain types of citrus has had on local economies all over Italy. Reading about some of the challenges of growing citrus (and the sudden mutations that can happen) has made me appreciate even more the subtly varying flavours different citrus fruits have. There are a couple of lemon varieties native to Morocco, typically called citron beldi (i.e. traditional lemon). What they have in common is that they are rather small in size (not much larger than a ping pong ball) and coloured bright yellow that almost tinges into orange. They are incredibly fragrant with a perfume not unlike that of bergamot lemons (the flavour we all recognise from Earl Grey Tea). Their most famous use is probably in preserved lemons – one of the key ingredients of many delicious Moroccan tagines. If you can get your hands on citron beldi or similarly profumed lemon varieties such as meyer lemons, it is very easy to make preserved lemons at home (David Lebovitz has a simple recipe on his website). In theory you can use whatever lemons (ideally organic) you can find at the market, but the flavour will be slightly different using normal varieties. Failing that, most Middle Eastern and North African delis will sell preserved lemons by weight these days. In addition to flavouring tagines, preserved lemons are also a wonderful addition to salads, they can serve as the base for a North African twist on gremolata to finish off rich stews (substituting finely diced preserved lemon peel and coriander for the lemon zest and parsley) and can be used for all manners of different marinades, especially for fish. But one should not stop there. Given how fragrant they are, I was curious to see how a cake made with preserved lemon would taste. 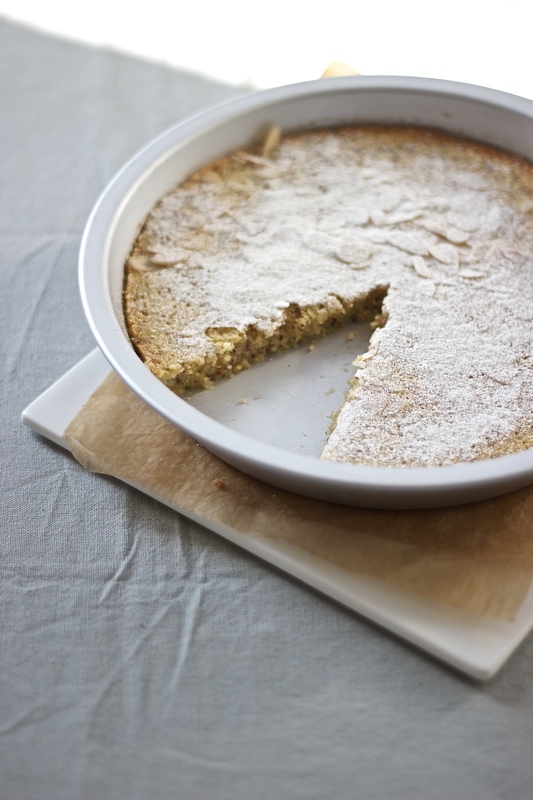 And what better recipe to adapt than Claudia Roden’s Orange and Almond Cake. Notes: If you love lemon flavoured cakes, you will love this cake. It is true that preserved lemons are stored in a salty brine, but once you rinse off the lemons and boil them in water, the saltiness is neutralised. So all the preserved lemons impart to the cake is their beautiful perfume. And the ground coriander? Earthy yet zesty in flavour, the small amount of this spice tames the perfume of the preserved lemons just enough to ensure the cake does not taste overly perfumed or soapy. In short, if you have been wondering what to make with that jar of preserved lemons lurching at the back of your fridge, make this cake! In a medium saucepan boil the preserved lemons for ca. 20 minutes or until soft. Drain and set aside. Pre-heat the oven to 180 degrees Celsius. Grease a round springform and line with parchment paper. Cut the lemons in half, remove the seeds, then add the lemons to the bowl of a food processor. Process until roughly chopped. Add the eggs, ground almonds, baking powder, sugar and ground coriander and process until combined. Pour the batter into the prepared springform. Bake for ca. 1 hour or until a skewer inserted into the middle of the cake comes out clean. Cool in the springform before serving. The cake will keep ca. 5 days at room temperature.